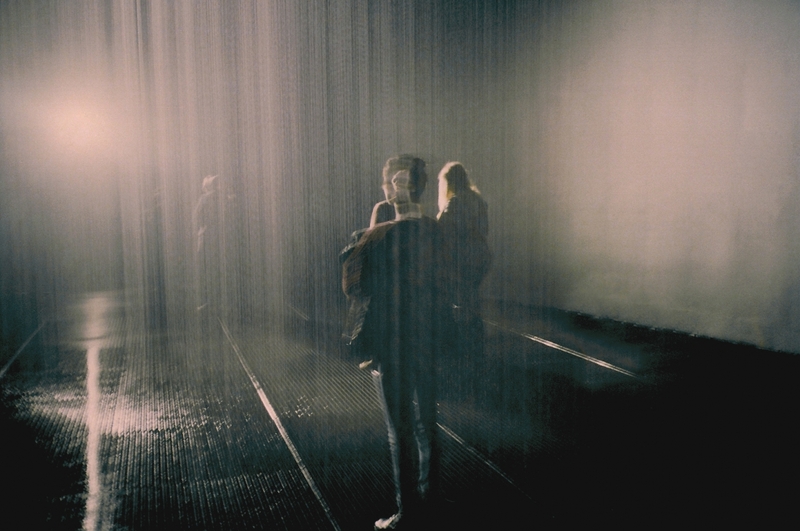 The Rain Room was an Art Instalation by Random International at the Barbican Centre and the mentioned subtitle comes from our dear photographer Nuria Rius after staying in a queue until she made it to the installation. Known for their distinctive approach to digital-based contemporary art, Random International’’s experimental artworks come alive through audience interaction. 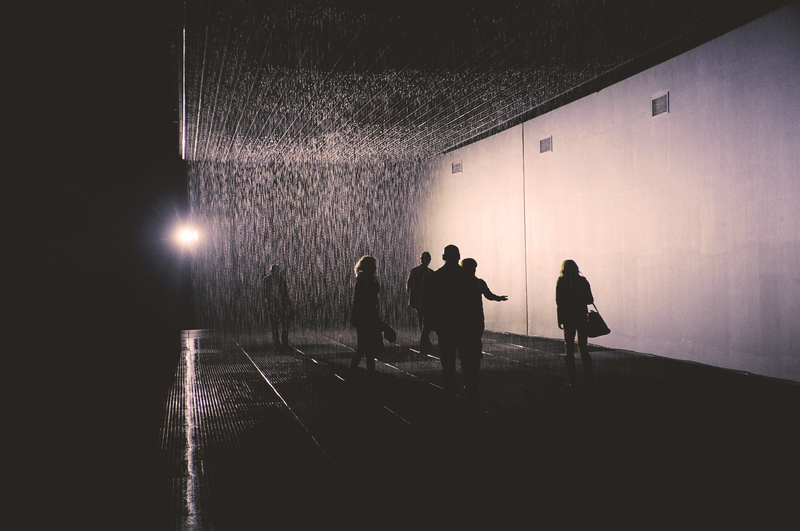 Their largest and most ambitious installation yet, Rain Room is a 100 square meter field of falling water for visitors to walk through and experience how it might feel to control the rain. On entering The Curve the visitor hears the sound of water and feels moisture in the air before discovering the thousands of falling droplets that respond to their presence and movement. Kate Bush , Head of Art Galleries, Barbican Centre said: Random International have created a new work every bit as audacious and compelling – Rain Room surpasses all our expectations. At the cutting edge of digital technology, Rain Room is a carefully choreographed downpour – a monumental installation that encourages people to become performers on an unexpected stage, whilst creating an intimate atmosphere of contemplation. The work also invites us to explore what role science, technology and human ingenuity might play in neutralizing our environment by rehearsing the possibilities of human adaptation. Random International said: Rain Room is the latest in a series of projects that specifically explore the behavior of the viewer and viewers: pushing people outside their comfort zones, extracting their base auto-responses and playing with intuition. Observing how these unpredictable outcomes will manifest themselves, and the experimentation with this world of often barely perceptible behavior and its simulation is our main driving force. Finding a common purpose as students at the Royal College of Art, Random International was founded in 2005 by Hannes Koch, Florian Ortkrass and Stuart Wood. Today the studio is based in Chelsea – with an outpost in Berlin – and includes a growing team of diverse talent. With an ethos of experimentation into human behavior and interaction, they employ new technologies in radical, often unexpected ways to create work which also draws on op art, kinetics and post-minimalism. Random International have gained international recognition, inspiring audiences from broad multidisciplinary interests. A breakthrough work of 2008, Audience, marked Random’s first installation with audience participation. Motorized mirrors disconcertingly respond to human activity in their midst in inquisitive, synchronized movements, with the viewer becoming both active agent and subject of the piece. Swarm, a light work of 2010, emulates the behavior of birds in flight: the sound created by the presence of visitors causes the abundant individual light sources to respond in swarm-like formations. With Future Self, new commission by MADE Berlin in 2012, the studio explores the direct interaction of the viewer with the full body image of the self, represented in light in three-dimensions.